When are you expected to see everything? The most complicated game ever? The following position was reached in the first round of the ACT Championships. It is Black's move and the first decision is whether to go into a king and pawn ending with Rg1+. To make the correct call, Black needs to be able to calculate whether the ending is winning/drawn/lost. In positions like this counting tempo correctly is crucial. Black decided to play 43. ... Rg1+ and after the forced 44.Qxg1 Rxg1+ 45.Kxg1 Kxd5 46.Kf2 he then had to decide how to clean up the a and b pawns. Meanwhile the spectators (including me) had come to the conclusion that Black now wins by a tempo with 46. ... Kc4 47.Kf3 Kb3 48.Kf4 Kxb2 Turns out we were horribly wrong as White is winning by a tempo in this position. However Black was a little smarter than we were as he grabbed the a pawn with 48. ... Kxa4 (instead of 48. ... Kxb2) and after 49.Kxf5 Kb3 50.Kg5 Kxb2 51.Kxh5 a5 52.Kg6 a4 53.h5 a3 54.h6 a2 55.h7 a1(Q) 56.h8(Q)+ Kb1 57.Qxa1+ the game was drawn. However, the post mortem revealed how tricky these endings really are, as White missed a win with 48.a5! forcing Black to take an extra move to capture the a pawn, and losing by a tempo. And if 48.a5! was good for White, it turned out that 46. ... a5! was just as good for Black, when Black ignores the queenside pawns and instead shepherds the f pawn up the board instead! A field of 30 players rolled up for the 2010 ACT Championship. This number is what was expected/hoped for, given the new tournament format. A couple of stronger players who were expected to take part were last minute withdrawals, in part to a stomach bug that seems to floating about Canberra at the moment. This leaves top seed Junta Ikeda outrating the rest of the field by over 300 points. Clearly with this sort of advantage he is favourite to win the tournament, and at the end of the first day he is on 2/2. Also on a perfect score are Pete Morris, Milan Grcic and Adrian De Noskowski. As for the tournament format (9 rounds over 2 weekends at 2 rounds a day), it was well received by those who turned up. The most common comment was that it felt like a real championship, rather than just a club event with a few visiting players. The tournament crosstable and a pgn file of games can be found at Ian Rout's website. In fact Ian probably played the best game of round 1, with a sacrificial win over junior player Yijun Zhang. On move 19 Zhang tried an aggressive move in the centre, only to be met by a whole series of aggressive moves aimed at his king. Ian then finished the game off with a nice rook sacrifice. The ACT Junior Chess League kicks off the inter-school chess calendar with the Primary Schools Girls Team Championships. Today the North Canberra zone of the Championship, with 41 teams taking part. What was particularly good about this turn out (165 players btw), was that the event filled up within a day of entries being called for. The event itself was played in excellent spirit, with the arbiters job a fairly light one. Of course there were the usual set of bizarre stalemates, but overall the quality of chess seemed higher than in previous years. At the end of the day 2 teams shared first place, with the Turner Kingfishers edging out the North Ainslie Cockatoos on tiebreak. The Amaroo Amazers (from the school mentioned in yesterdays blog) finished in third place. For 2010, Amaroo School (in Canberra, ACT) has added chess to the school curriculum. Each 3,4 and 5 grade classes (250+ kids in total) has 1 hour of chess per week one of its regular subjects. The classes are run in a specialised chess classroom, which is fitted out with sets, posters and will soon have a smart-board system installed. The classes are taught by one of the schools teachers, who has put together a chess course for the year. The school is also running 2 lunchtime chess clubs (one for primary school and the other for high school) and are getting 60+ children to each session. Of course the aim of the program isn't just to get more kids playing chess (although that is always a nice goal to achieve) but to also use chess as a tool to improve the educational outcomes of the school's students. At the school's Parent Information evening, the listed benefits of the program included improved concentration and problem solving skills, as well as better memory and strategic thinking. Hopefully the program will produce masses of happy, smart, chess playing kids (including my daughter) and that its success will encourage other schools in Canberra to implement similar programs. The 2010 ANU Chess Club Masters has reached round 3 and Adrian De Noskowski has taken a suprise lead. He has started the event with 3 straight wins, and holds a half point lead over top seed Andrey Bliznyuk and Emma Guo. In his round 3 game he was able to keep Ian Rout's king in the centre long enough to bring his rooks into play. The after opening the lines in the centre he was able to launch an unstoppable attack. The round 8 game between Topalov and Aronian from the current Linares tournament is provoking some interesting discussions on the various chess forums around the world. In the diagrammed position Topalov played 34.Bb3 and the game was eventually drawn. Instead Topalov could have played 34.Rxe4 which leads to a winning position after 34. ... Qxe4 35.Qc3+ Kg8 36.Qc7! Topalov's missed win has been described in a number of different ways. Commentators on ICC described it as a 'blunder', while young GM Anish Giri thought that a 2800 player should have found 34. Rxe4 in a couple of seconds. On the other hand GM Mikhail Golubov in ChessToday was far more diplomatic. "Missing a really nice win" was his comment to White's 34th move. Personally I prefer Golubov's take on the situation rather than the "OMG, he didn't see everything" crowd. In part because I feel the commentators are holding Topalov to a standard of perfection that none of us will ever achieve, and also because it is easier to find moves like 34.Rxe4 from a 'standing start' rather than as part of the thread of a 3 or 4 hour game. Using studies as a training tool is (a) quite effective and (b) not that popular. 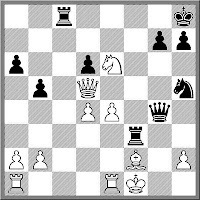 As with other chess problems (in the classical sense) chess players tend to shy away from 'unreal' positions. But it is only looking at 'normal' positions, and 'normal' moves that can cause the biggest blunders. The diagrammed position is from a game played at Street Chess last week. It was one of the last games to finish for the round, the crowd had gathered round, and White was running short of time. No problems. 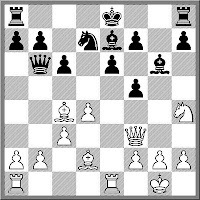 With the study like 1.Qa4 (resisting the usual urge in Queen endings to check like a maniac) White set up a mate in 1, and iced the game. Is the diagrammed position stalemate? Clearly not, as White has 20 legal moves that can be played. Of course one piece that cannot move is the King, (amongst others), but that hardly matters now does it? 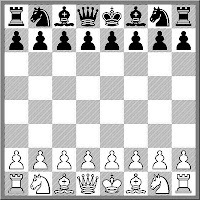 However anyone arbiting school events, where the knowledge of the rules of chess usually exceeds the understanding of them, has often come across an incorrect stalemate claim based on the idea that 'the king has no safe squares but isn't in check'. Usually I listen to such claims before pointing out the other pieces on the board that can move. Interestingly such an explanation is often met with a look of confusion ('but the king cannot move'). 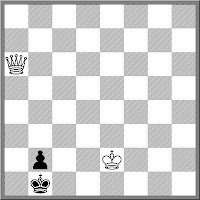 So to drive home the point I ask them if the king can move at the start of the game. After they answer 'no' then the truth usually dawns. But to cheer them up I usually tell them that under 'their' rules, they could easily draw with the World Champion, by claiming stalemate on move 1! One observation of modern society is that we have become "money rich but time poor". Over the last few years this has been a topic of discussion between myself and few chess organising friends of mine. 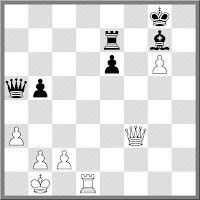 In the Canberra chess community this has been discussed in the context of 'club v tournament'. Do players want to play 'club' chess, with the need for a weekly commitment of time (usually 3 or 4 hours on a weekday evening) or are they happier with 'tournament' chess, where the tournament starts and finishes within a single time frame (one day or 2 day event)? For the moment the two largest adult chess gatherings each week are the ANU Chess Club (Wednesday nights) and Street Chess (Saturdays). The ANU is very cheap ($10 membership per year to cover ratings) but rated events are either 3 or 6 weeks in duration. Street Chess on the other hand charges an entry fee each week (only $5 but that would be $260 a year if you played every week), but the tournament is run and won in a 4 hour period. For the moment both events are probably neck and neck in popularity, although interestingly both club and tournament have increased numbers of the last 2 years (other factors are clearly at play). However, while there is an overlap between players who play both, there is still a significant group who will only play 1 format or the other. But in terms of attracting new players to tournament chess, the single day event is far more successful. And this makes sense as it is easier to try something new in 4 hours rather than over 6 weeks. Over the last 5 or 6 years I've put together a problem quiz for the Christmas edition of Australasian Chess. I've mainly chosen problems composed by others, as my own attempts at problem composition have never amounted to much (My only 'Mate in 2' submission to a magazine was returned with the note 'too simplistic'). To avoid people simple solving the problems through shear processing power, a lot of the puzzles have little 'tricks' attached to them. Often these tricks involve ideas outside the usual rules of chess, although nothing downright illegal. One trick used in passed years is the 'upside-down' board trick. In these sort of problems there is no possible solution, unless the board is rotated in some way. The pawns can move in ways that are not obvious, thereby furnishing an answer. However this isn't the only trick, as the problem on the right will show. 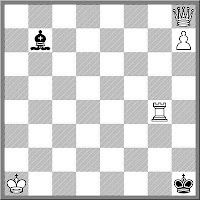 It is White to play and Mate in 1. As there is no Mate in 1 in the set position some deductive thinking is called for. 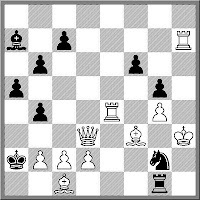 When I set this for last years quiz, a number of solutions claimed that as there was no way the Black King could legally get to a2 and there fore the board *must* be the wrong way round. While they were right about the Black King it turns out they were wrong about what this means. There is another, far more creative solution to this problem. Due to my editing duties with Australian Correspondence Chess Quarterly, I spend some of my time digging through archives of old magazines. When I look at the games published in the late 40's and early 50's I am intrigued by the number of French Defence games. 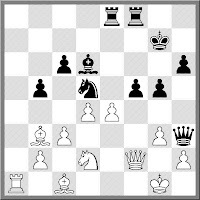 It seems like a very popular opening, although in must published games, Black gets smashed. There are probably a few reasons for this (in Australia at least). CJS Purdy recommended it for Black in a number of articles in Chess World (which much much later was turned into a book title "Action Chess" published by Thinkers Press). I also suspect that the subtleties of the Sicilian Defence hadn't reached these shore post WWII, leaving the French and the Caro-Kan as the two main non-symmetrical defences to 1.e4. But as I said earlier, despite its popularity it seemed to take quite a beating. Of course this could simply be a matter of game selection, with snappy wins much more publishable than slow, positional grinds. Here is an earlier example of what was happening to the French from 1933. Dug up by Paul Dunn it is a quick win by Spencer Crakanthorp over Gary Koshnitsky from the NSW Championship. 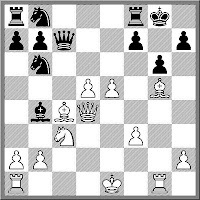 When the game was played, Koshnitsky was the reigning Australian Champion, but Crakanthorp both won this game, and the NSW Championship as well. The moral of the following game is "If one piece is bad, then your whole game is bad". Take a look at the Black knight entombed on h8 as a prime example of this. It is still a month away, but I'd thought I'd highlight the 2010 Dubbo Open. The tournament is celebrating its 10th year this year and the organisers are hoping for a big roll up. It is on the weekend of the 20-21st March 2010, at the Dubbo RSL Club (where it has been for the past 9 editions). It is 6 rounds, played with a time limit of 60m+10s per move. The last few years have seen a reaonably large field turn up (46 last year IIRC) and the aim is to crack the 50 mark this year. I've certainly enjoyed the 5 or so tournaments that I've played in, and intend to make the trip up again this year. Apparently this is an old saying from the Manhattan Chess Club. I don't think it is always true but in the following game it certainly is. It is from a recent Marshall Gambit Thematic Tournament on the ICCF Webserver and contains some interesting alternatives to current high level theory. The ACTCA is trying a new approach to the ACT Championship for 2010. After years of declining numbers and declining strength, the Championship this year will shift from the '1 round a week at whatever club will hold it' format, to a compressed double weekender schedule. The first 4 rounds will be held on the weekend of the 27/28th of February with the last 5 rounds on the Canberra day long weekend of the 6th, 7th and 8th of March. 2 rounds a day will be played , except on the 8th, which will have 1 round followed by prize giving. It will be once again run as an open swiss, in part because recent proposals to move it to a round robin format keep getting shot down at the AGM. Time limits will be 90m+30s per move. Venue will be the ACT Junior Chess League Centre at Campbell High School. Entries will be taken on the date of the first round (26 Feb) from 9am. A few years back I posted about a Quick and Dirty Rating System. While going through back issues of the CCLA Record (the forerunner to Australian Correspondence Chess Quarterly) I found a similar but even more basic system. Calculations are on a game by game basis and works as follows. Firstly you find the difference between the 2 players ratings, rounded up to the nearest 20 points (RD). The if the higher rated player wins they gain 50-RD/10 points while the loser loses the same amount. If the lower rated player wins the gain is 50+RD/10 points while again the loser drops the same number of points. In the case of draws the lower rated player gains RD/10 and the higher rated player loses the same amount. The rating differences are capped at 500 points so the biggest rating increase possible is 100 points per game. Again this system isn't as accurate as systems built on stronger mathematical models, but for a local chess club it is easy to implement, understand and use. I came across a couple of interesting posts concerning chess in movies and pictures. The first post is about the 'Roller Coaster Chess' gag, which involves gluing pieces to a board, then sneaking it onto a roller-coaster or log ride, and getting your picture taken. With a steady stream of high level chess tournaments happening every month it is easy to overlook the next big tournament. Linares starts tomorrow, something I wouldn't have realised if I hadn't seen this article on it at Chessvibes. Now I know it is a very strong tournament (Topalov, Aronian, Gelfand, Gashimov, Grischuk, and Vellejo Pons, all over 2700) but I just get the feeling it doesn't stand out from the crowd like it used to. Possibly this is because the names Carlsen, Anand or Kramnik aren't part of the entry list, although it may just be the fact that there are more 'super' Super-GM tournaments being held these days. However I am sure that there will be plenty of exciting chess in store, and I am going to tip sometime Canberra visitor Lev Aronian to win this year. For the first time in its short history, the Australian National University Chess Club is organising a FIDE rated tournament. The 2010 ANU Chess Club Masters began this evening on the first club night of the year. It is a 10 player round robin with 5 FIDE rated players and 5 FIDE unrateds. The aim of the tournament is to give more club members FIDE ratings, as well as to play some serious, long time control chess. 4 of the 5 games from the first round were played this evening ( 1 deferred game will be played in a few days) and it looks like the field is still feeling each other out. 3 games were drawn while the 1 decisive game was in a sense 'un-drawn'. Alongside the Masters event was the clubs regular swiss tournament and this attracted a healthy field of 22 players. So for an opening night, 32 players in attendence is a very good figure. Via a link from English chess organiser Adam Raoof, I came across the English Chess Forum. It has a comprehensive set of topics related to the English chess scene, including a section on the English Chess Federation itself. One of the sub topics in this section is titled "What am I doing?" It is for ECF office holders to fill everyone else in on what tasks they are working on, such as pursuing media coverage, sponsorship opportunities or government lobbying. From the look of it, it is a very active section with the ECF President CJ de Mooi (of TV's "Eggheads" fame) being a regular poster. Interestingly, the English Forum seems to operate in a similar manner to Chess Chat in Australia, at least in regards to its relationship with the English Chess Federation. It isn't the official forum of the Federation, and it appears that the ECF doesn't even provide a link to it from its own home page. I suspect in part this may be due to the fact that ECF office bearers don't do double duty as admins on the English Forum, resulting in a more robust debate on topics concerning English chess politics. Once again I failed to make it to this event! One of these years I will actually get there, but only when I am far richer than I am now. This years event finished in a tie for first between GM Alexander Ivanov and Bermuda Olympiad Captain GM Nick De Firmian. A number of familar faces from various Olympiads did well in the event, with Bermuda player Kennedy Simmons winning a class prize. While the tournament doesn't seem to have an official website, I did pick up the results, some wonderful pictures, and good coverage of all the activities from Castling Queen Side, a blog run by female American player Polly Wright. Combining chess and blogging didn't seem to effect her play as she won the Under 2000 prize in the tournament. A hard thing to decide, because the criteria is so fuzzy. What defines 'complicated'? Confusing, Baffling, or Incomprehensible. I would probably throw in some element of 'surprise' in the sense that what really happened only becomes clear at the conclusion of the game. 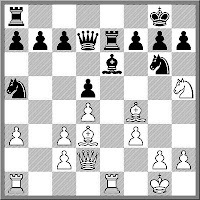 One candidate would be the Bronstein - Ljubojevic game from the 1973 Zonal. I've seen this appear in a number of game collections and in each there are pages and pages of analysis. Bronstein himself devotes 17 pages to this game in "The Sorcerer's Apprentice", although that utilises analysis done by Timman and Keres in other publications. I kind of suggested last week that Michael Adams was moving down the chess pecking order, as evidenced by his participation in the Gibtelecom tournament in Gibraltar. Of ocurse given such a comment he went and won the event, defeating Vellejo Pons in a playoff for the title. I quite like the observation made by Arthur Yusupov in his book "Build Up Your Chess". "Most mistakes occur in the early moves in variations" he says, pointing out that calculating long variations are useless if miss a strong reply from your opponent at move 1. To overcome this he suggests that you learn to calculate short variations accurately. One way of doing this is to solve Checkmate in 2 problems. 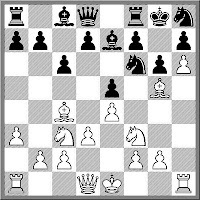 As much as the 'practical' chess player dislikes Mate in 2's for their contrived positions, by solving them you are forced to take into account every possible reply from your opponent. 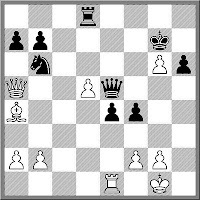 Here is a Mate in 2 from Yusupov's book, which I set as a puzzle for a group of juniors. While it took me quite a while to find the key move (eventually realising that it defeated the most obvious Black defence), the group of juniors solved it quite quickly, and then complained that it was too easy! For all the 'wrongness' that is Facebook (no link provided!) it is a boon for chess bloggers and journalists. Connect with the right personalities and you can get the inside track on some pretty good news. However, the drawback of this for the player is sometimes there losses show up just as much as their wins. Good friend of this blog, Henrik Mortensen, has been providing a day by day commentary of his performance from the Gibtelecom tournament in Gibraltar. From a distance it looks like he is having a good tournament, with the occasional loss. However it was his description of the following game that drew my attention to it. In describing the game Henrik said "FM Fabrice Wantiez (BEL - 2315) really crushed me in a flashy style in just 22 moves. He sacrificed like a devil..." If not for this vivid description, I probably would not have noticed it at all. Roger Farrell made another brief visit to the local chess scene, and walked away with the title of ACT Lightning Champion. In a field of 26 players Farrell cleaned up the field with a perfect 9 wins from 9 games. Interestingly the tournament may well have been decided by the end of round 1, as top seed Farrell defeated 14th seed Mario Palma, who then went on to tie for equal second on 7/9. Also second was Elwyn Teki, one of the many Queensland chess players who are unable to resist the lure of the nations capital. I've commented on the past about the ups and downs of club membership levels in Canberra, observing that at most times 2 clubs seems to do well, while the other 2 struggle. In country Australia it is a different story as most communities would only support 1 club, if they have a club at all. Again the factors that affect the overall participation levels in the nationwide chess community (chess culture, publicity, having other things to do etc) occur at the street level in the country, often to the detriment of numbers. A number of country towns have had thriving chess clubs for a few years (if not decades) only to see them slip away. I remember Orange having a club in the 80's, and a regular weekend event, but it eventually disappeared, although two country towns in that general area, Blayney and (much further away) Dubbo, now do have clubs, where before they did not. One town running into trouble on the club scene is Mackay in Queensland. ABC regional has even done a report on the troubles facing the Mackay Chess Club, and you can see the report here. While the win by Magnus Carlsen in the 2010 Corus Tournament is yet another outstanding result for the undoubtedly future World Champion, in later years this event may be more remembered as Shirov's tournament. Not for his placing in the event (equal second with Kramnik), but for both how he started the event, and then how he finished it. After beginning the tournament with 5/5, Shirov began to slow up before two losses allowed the other contenders to catch up. However he almost had a chance to reclaim a share of first place if he could win his final round game against Dominguez. Following the standard Shirov strategy of waiting until the opponent commits his king, and then going the hack, he almost pulled it off in game full of sacrifices. However the calculation ate up all of Shirov's time and he played it safe by agreeing to a draw. Unfortunately in the position where he halved the point, he had a winning move. This missed half point allowed Carlsen to take first place after he drew a messy game with Caruana. 31.b4 wins on the spot, as the quuen is driven away from the defence of a8 eg 31. ... Qc7 32.Qa8+ Bf8 33.Rf1 winning.